Welcome to 2017! I’m still on vacation (can’t you tell? ), but Trump sure isn’t. He shot off two tweets last night. North Korea spent 2016 demonstrating new and sometimes surprising capabilities. They don’t always tell the truth, but frequently they do. See that translucent color? It looks way different than the plumes we see on the Nodong. It’s possible they’re kicking the RFNA habit and going to a more energetic fuel. 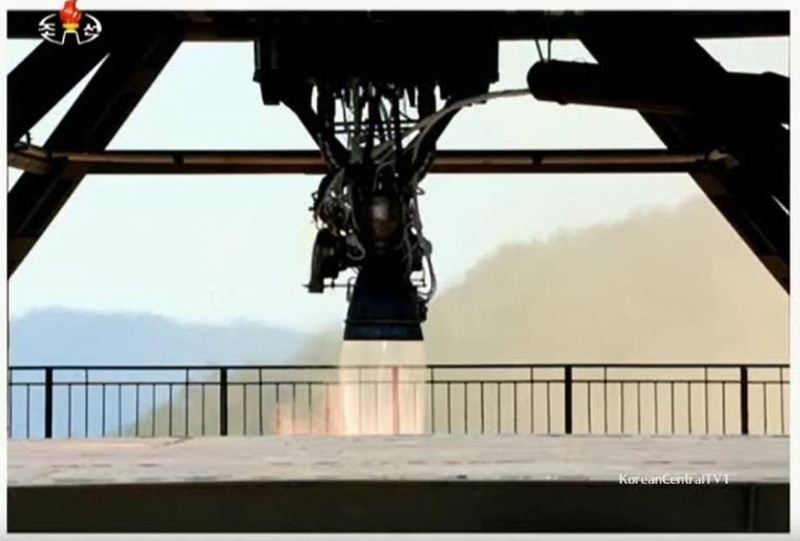 I still haven’t collected enough pictures of the Sohae engine test stand and other fuel/oxidizer combos to authenticate whether someone was messing with the color in the photo, but it’s plausible that this fuel is something more like UDMH/NTO. What does that mean? This engine will either take the missile farther, carry more weight, or some combination there in. But what about the second stage of that KN-08? Well, they possibly tested that in September. Ankit Panda and John Schilling both wrote about that test. Ok, so they have two powerful engines for two stages of the KN-08, what else do they need? 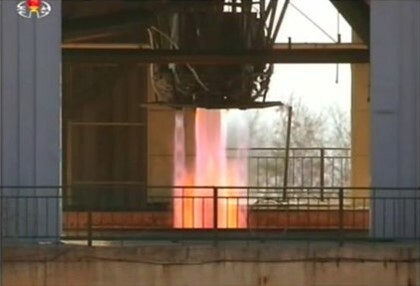 A heat shield to protect the warhead as it reenters the atmosphere. So, they “tested” one of those in March 2016. Why the air quotes. Well as they said themselves, it’s a simulation not a test. Does it seems kind of silly to simulate the heat and pressure of reentering the atmosphere by flame-broiling the thing with a scud engine? I thought so, but then Jeffrey Lewis told me that’s how the good ol’ US of A did it in the 70s. Ok, so they have the engines, and probably the fuel and heat shield for their ICBM. They are also parading around a spooky disco-ball which fits nice and snug in the tip of the thing. What next? Flight tests. If Trump thinks leaning on China will will help, then he should get in line on that tired old idea. Problem is China and North Korea’s relationship is the worst it’s ever been. Kim didn’t even mention China in his New Year’s address. I’m not saying Trump doesn’t have some silver bullet idea cooked up that he will unleash on us in 140 characters after one briefing with the IC, but I’m not holding my breath. What do you think? Comment below. Trump wants help from China on NK but holds a call with the Taiwanese President? You should read carefully what Trump said. He only indicated that China is getting trade benefits from USA and not controlling NK. He possibly will use trade sanctions to pressurise China and not giving up relation with Taiwan. I’d think that July 3rd or July 27th would be a good time to have a strong radar in the sea of japan. I think Trump should go meet Kim on some neutral island of Dr. No and parlay. Maybe they can actually bring an end to the Korean War. If nothing comes of it, might be time to start shooting down their missile tests as deterrence to MAD deterrence, i.e. how ARE you Dr. No going to deliver that disco-ball? The final step would be military action to neutralize the DPRK ICBMs and the nuclear weapons manufacturing as was mentioned in the CNN article today. China’s not going to like any containment of Kim’s aggressive belligerence. They seem to be actually encouraging Kim as a counterbalance to the United States while they continue their militarization of the South China Sea with man made missile bases. Trump’s got a point — why do we give China money to fight us in 10 or 20 years and to prevent us from pressuring Kim? We need a new China peace treaty that includes full sharing of the South China Sea as well as a full end of the North Korean military program — if China wants to continue selling us manufactured goods. Trading with a promised enemy is like the Athenians sending their children every year to the Minos and his Minotaur. The current laissez faire policy is not working. The “sanctions” are not working. “Pressure” on China is not working. Unfortunately, credible deterrence requires a credible red line. Obama didn’t understand credibility so all militarily aggressive countries just walked all over him. Trump IS our President. He is a little scary. Maybe he can fix this problem. He can solve some of these problems, but will no doubt cause a few more along the way. How is Dr. No going to light the dance floor? Well, as long as we’re discussing impossible movie scenarios, like shooting down Nork ICBM tests, how about smuggling the ball in? Then hide it in someone’s basement or backyard, and when things have settled down, discreetly let its presence be known. Bingo, deterrence! Not a terribly realistic scenario, for lots of reasons. Ditto for a preemptive attack or missile test intercept. But in a world where the latter sort of thing could happen, I wouldn’t rule the other one out. I absolutely cannot see how NK ICBMs are worth a massive trade war with China. What, specifically, are we hoping China will do? They’re barely on anything you could call friendly terms as it is. I would have thought big dumb ICBMs would be easier to monitor than the alternative anyway. If they want to hit the US bad enough to be wiped out in return, I would have thought a few shipping containers would be more of an issue. By comparison, an ICMB is even less deniable, and even more certain death. I mean, are we ever going to be happy to see Seoul burn? No, we aren’t. So we’re done. They’ve got sufficient D to reach an effective MAD deterrent with or without ICBMs. Potentially *starting* a war to stop NK using nukes is far MORE likely to see them use one than sitting back and watching them develop ICBMs. 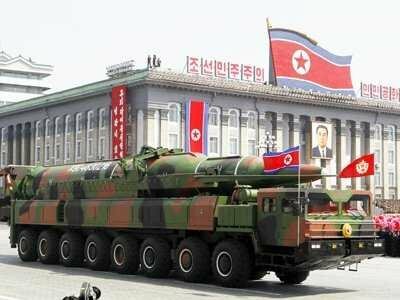 For the duration of Trump’s first and perhaps only term in office, I would expect North Korean ICBM-class missiles to be even less reliable than American ICBM-class missile defenses. So Trump’s boasting may come to pass, as comedy in the first act. Illustrated with a nice montage of exploding missiles, even. Should be fun. That still leaves POTUS/2021-2025 to deal with the tragic version. Melissa; why the urge to highlight the Missile Defense Agency theme of ‘panic’? I strongly suggest that we recall that unflown long range missiles are mostly threatening to the launch point itself and long before policy people accept the claims of the DPRK weaponization of their ‘gadget-level’ nuclear explosives that a jaunt into the history of the establishment and sustainment of the Sandia National Laboratories is indicated. Mr. Trump could simply be running a very safe bluff that the first missile flight attempts by the DPRK are uniformly failures. Further, the most complex missile they have flown has a demonstrated reliability of 12.5% (or less as successful reentry wasn’t claimed) and a multiple stage ICBM is far more complex. You’re being reality based again, Melissa. The problem is that the President-elect’s reality is whatever he says it is right now, and he is under no compulsion to be consistent with it. He will say a North Korean ICBM will never happen until it does and then he will deny that it is real and then he will deny ever having said it wouldn’t happen. None of this prevents or even slows the development of such a missile, but then it was probably too late for that anyway. Keep in mind that “Reality based” was originally used as a pejorative to describe democrats. The inference was that conservatives, and neocons specifically, weren’t bound by mere reality and would make their own by force. This kind of thinking, both by the Donald and by the electorate, is far more dangerous than any ICBM ever will be. Great stuff. Tiny quibble: I don’t think Xi-Kim ties are at their nadir [nor do I think things btwn PRC-DPRK worst in their history]. I think that was summer 2015, Park Geun-hye on the Tiananmen rostrum, Choe Ryong-hae lurking in the shadows. That was highpoint for Xi-Park and lowpoint for Xi-Kim. But then Oct, Xi sends love letter to PY carried by Liu Yunshan. & Jan-Feb, Park feels like spurned lover when Xi doesn’t pick up phone after Kim’s test #4. She gets mad with THAAD, Xi gets even THAADer. Yes, yes, 2270 and 2321. Xi remains irked. And yes, totally agree, very significant Kim does not even mention the name CHAI-NA! in his speech. Still, things have been worse between BJ & PY. They’ve been basically getting better since Oct 2015. In contrast w BJ & Seoul. None of this detracts from your point that Trump’s 2nd China tweet is misguided and a diplomatic dead-end. Nor should it detract from the great work you’ve done to lay out the development of capabilities. Very illuminating. Thank you. I wonder if you think the DPRK’s missile tests in June 2016 are also relevant. These were written off as partial-failures by the ROK and US because they landed in the Sea of Japan (East Sea) but there is good analysis by David Wright suggesting that one of the two tests was deliberately lofted in order to test re-entry. Part 2 of his analysis is here: http://allthingsnuclear.org/dwright/12349. Lofting also overcomes the difficulties of finding a suitable place to test IRBMs/ ICBMs: if the DPRK shoots it straight over the territory of Japan (for example) it could incur risks of retaliation. I touched on this in a recent article for NK PRO on Kim Jong Un’s NY speech, available here: https://www.nknews.org/pro/kim-jong-uns-new-year-speech-less-songun-more-focus-on-economy (paywall). 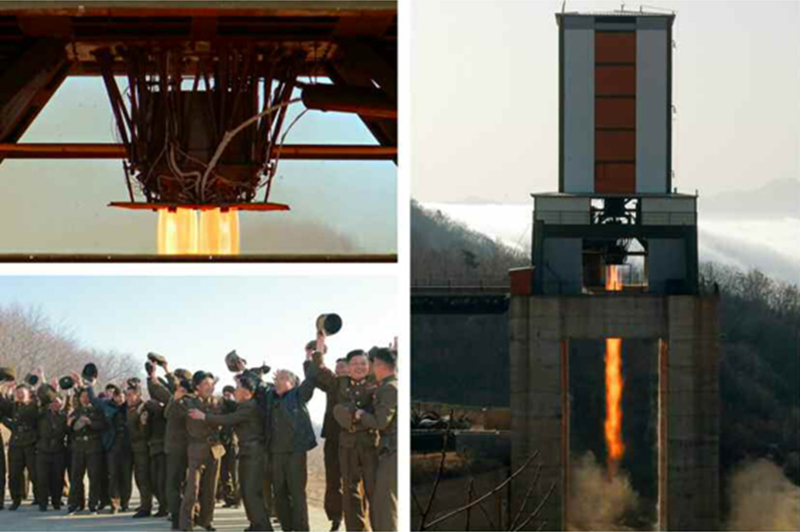 (i) The DPRK announced in 2015 that it had developed CerMet manufacturing facilities. I wonder if this will be helpful to them in overcoming the heat of re-entry difficulties and would be grateful for the thoughts of others on the relevance of CerMet to missile re-entry. (ii) There is the challenge of missiles breaking up on re-entry due not only to the heat, but also mechanical stress and vibrations. In this context, I wonder if the DPRK’s indigenous progress in CNC lathes may have helped produce more accurate construction of missile components, reducing rattle and thus helping secure missile integrity upon re-entry. 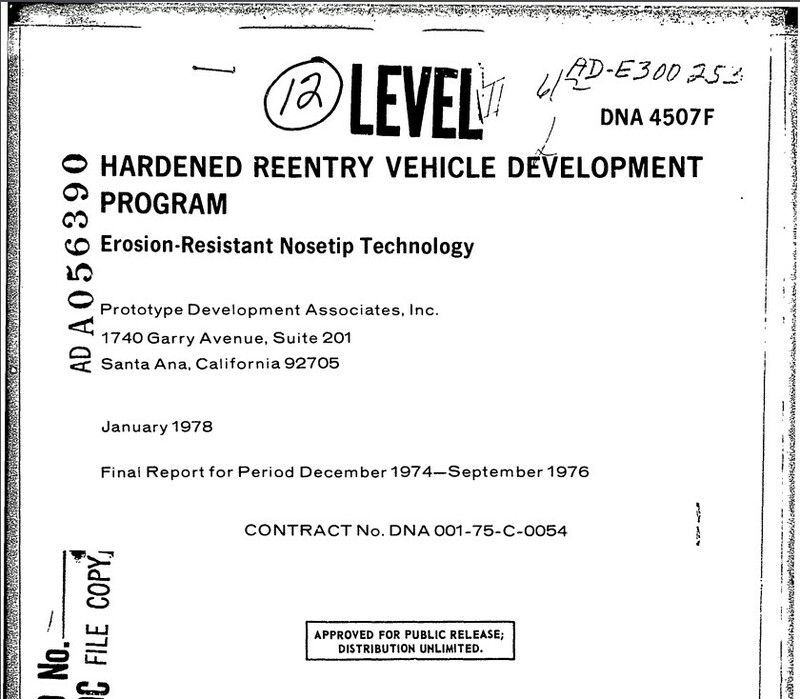 Public data in the historical record talks to ablative heatshields as being the approach selected by both the US and the Soviets for effective and low cost material approach to military reentry. Cermet would be a very high temperature approach and the specific engineering of military heatshields is appropriately an ITAR / MTCR topic that most experts will decline to discuss. Engineering factors involved in the control of the reentry environment are also ITAR/MTCR topics and practical aspects of NCM technology application to design and fabrication of reentry vehicles are not found in the public domain. You are free to speculate but publication becomes problematic. 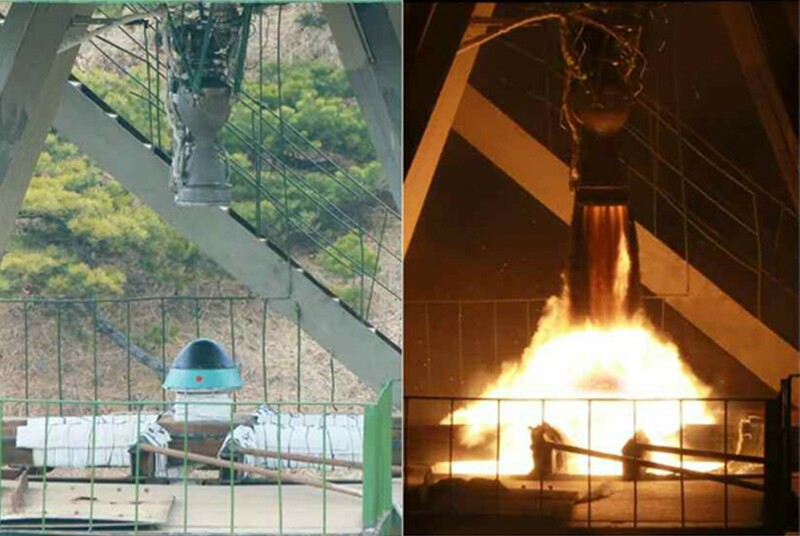 The 2016 tests show that North Korea can get a 1-2 out of 8 success rate for a new-ish single-stage missile with a proven engine design. From past experience, we know they can do better than that if they are willing to take their time, but if we take Jong-Un’s comments as promising an imminent test for political purposes, that suggests they would be rushing things. Rushing into test with an entirely new multistage missile whose first stage propulsion system at least has seen only limited ground testing, is going to be a recipe for failure on a grand scale. As for missiles breaking up on reentry, it is pretty clear that the North Koreans (like everyone else) is going for separable warheads on their long-range warheads. Those are generally more robust, and they have been doing some ground testing already. Probability of breaking up on reentry is small, but accuracy for the first tests will likely be very poor. By the time it gets to re-entry the missile has done it’s job and fallen away. What’s left is a largely solid state package with few moving parts being buffeted and heated by atmospheric drag forces. My understanding is that most re-entry vehicles are protected by ablative covers that protect the vehicles by “boiling away” under the heat. Think of an ice cube in a frying pan. Sure the cube is going to melt and boil away eventually, but something sitting on top of it will last a surprisingly long time. Building RVs is a matter of physics and thermodynamics more so than machining. 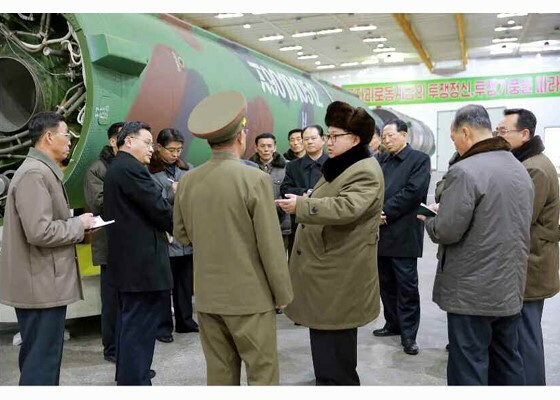 It was a public rational concise summary of major achievements of DPRK missile program . Well done. Trump acts as if nuclear war will never happen. But the Trump abandonment of globalism and return to isolationism reduces US dependence of global trade . By reducing dependence on global trade , the US helps prepare for global international nuclear conflict that would destroy global trade. Global proliferation of nuclear weapons is likely future regardless of US trade policy . US isolationism will accelerate global nuclear proliferation. The result becomes a self fulfilling prophecy . Some things can not be stopped. I was under the impression that they haved a liquid-fueled submarine-launched (they ARE crazy) theatre-range missile. If they pop up and launch, any target is left punching at shadows. If you nuke the NORKS you also nuke China AND the SORKs. Interesting to see how US isolationism works when 100% of the rare earth metals required in tech are 100% mined in China. China has SUCH deep pockets. Just enforce an export ban to the US and watch the whole country go bankrupt. This is hardly secret information, more something that nobody seems to have realized. No more Intel, No more AMD, the whole of Silicon Valley gone. So, From automobiles to white goods to aircraft parts. No materials. I don’t think the EU are going to follow the US and in fact they will just begin trading with Russia again. That being the case, the EU market is the worlds largest so, in fact, they can just abandon the US. People are beginning to note that Moscow is closer to Brussels than Washington. I wish good luck to all of my good friends in the US & Canada. Of course, Canada being part of the British Commonwealth means you get some points just for that & your NHS number is just transfered. I will do what I can for my US friends. “this is not my dog monsieur “. should Kim get some though of independence ,beside some purely local mischief , his body would be floating in the Yalu faster than you can say “Bad for business” in mandarin . 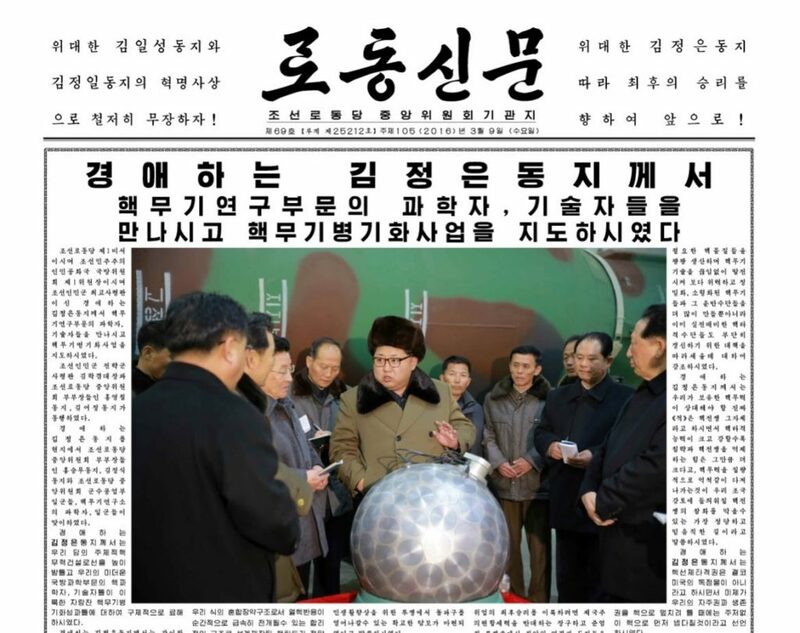 That would be the shiny silver 60 cm or so ball with dots all over it, in front of Kim in that one photo. We’ve been calling it “Disco Ball” as a popular name, for obvious reasons.